If you’ve ever played an Angry Birds title and have fond memories of trying to beat challenging Angry Birds levels, you’ll also enjoy Angry Birds Dream Blast! To find out how it differs from the original Angry Birds games, simply continue reading to discover everything you need to know about Angry Birds Dream Blast. 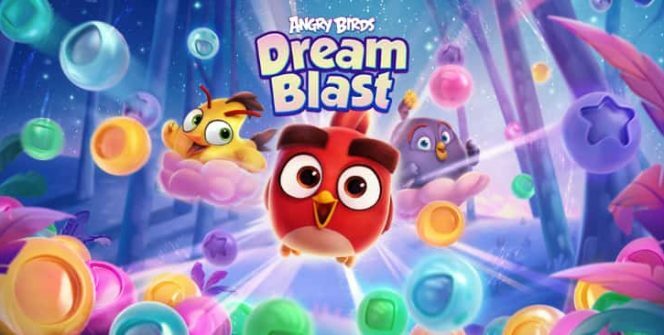 While the original Angry Birds title was a physics-based puzzle game, Angry Birds Dream Blast revolves around popping bubbles in order to complete puzzles. When you first start playing Angry Birds Dream Blast, all you’ll need to do is match same colored bubbles, in order to pop a group of same colored bubbles. When you pop a large group of bubbles, you’ll earn a red booster, which you’ll be able to use to take out two lines of bubbles at once. 1. Simple yet addictive gameplay. If you’re looking to start playing a casual game which doesn’t require a huge amount of concentration and which can be played when you’re looking to pass time, you’ll love Angry Birds Dream Blast’s simple yet addictive gameplay. 2. Unique levels, that will keep you guessing. 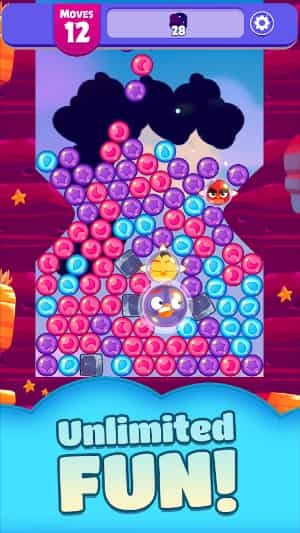 Another reason why you’ll enjoy playing Angry Birds Dream Blast is that the bubbles which feature in each level will fall differently, which ensures that you’ll have to adapt your strategy, from level to level. So if you get bored of playing games which feature monotonous levels, you may have found a challenging new game, which will keep you guessing for hours on end. 3. There are already countless levels to complete. Angry Birds Dream Blast features hundreds of levels. So you don’t have to worry about becoming addicted to Angry Birds Dream Blast and running out of levels to complete. Better yet, Angry Birds Dream Blast’s developers Rovio, plan to release new levels every Friday. 4. You’ll have five lives to play with. When you download Angry Birds Dream Blast, you’ll notice that you’ll have five hearts, which represent lives. Each time you fail a level, you’ll lose a life. However, over time your hearts will replenish, which means that you’ll have no trouble playing Angry Birds Dream Blast, multiple times per day. One of the reasons why the original Angry Birds title was so popular is that it features high-quality graphics and cute characters which you’ll quickly grow to love. Thankfully, Angry Birds Dream Blast is no difference and you’ll instantly fall in love with its baby birds such as Baby Bomb, who is even cuter than the birds which you would have played with when you first played Angry Birds. 6. It features a plethora of different boosters. As an example, if you match two red boosters, you’ll be able to blast bubbles in four directions. So it’s well worth trying to create as many different boosters as you can. So if you’re an Angry Birds fan or simply love playing bubble themed puzzle games, it’s definitely well worth downloading Angry Birds Dream Blast! Sometimes when playing Angry Birds Dream Blast, bluestacks ask you fee to pay but gives you option to download some apps. Every time it asks you just select “Install apps” and continue using it free. I hope you enjoyed this article, please rate and share. If you have problems running Angry Birds Dream Blast on your desktop or any other issues, leave a comment below.